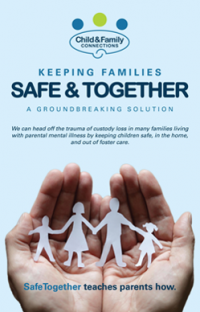 SafeTogether - Child & Family Connections, Inc.
As many as 70% of children whose parent has a mental health condition are removed from their homes and placed into foster care—even when the court has found no evidence of neglect. Often times, when a parent is receiving treatment services, they are at particularly high risk of custody loss. Philadelphia has the second highest child removal rate of any major city in the United States. SafeTogether is the first program in the country to reduce custody loss in families living with parental mental illness. SafeTogether ensures that a responsible adult, designated by the family, is caring for the children in the home whenever the parent is unable to do so. At the same time, SafeTogether ensures that the parent receives effective and efficient psychiatric care—according to his or her personal preferences—so the family can soon return to everyday functioning. Over six-weeks, parents who have a serious mental health condition, along with their workshops. They learn, share, and create a legally-binding emergency plan that is customized to the unique needs of their family. Beyond the classroom, each family receives private coaching sessions to help them implement their plan. Fundamental to SafeTogether, the family establishes an integrated support team of friends and relatives who collaborate with the parent’s professional treatment providers. Each team member has a defined role and set of responsibilities. A parent feeling unwell or the heightened concern of a child or support team member triggers the plan. A capable and caring group of people manage and monitor the children’s well-being, the parent’s health, their home, household, and finances. It’s a coordinated effort to keep every family safe and together. SafeTogether is projected to reduce custody loss in participating families by 88% while saving Pennsylvania taxpayers much as $7.9 million over the next four years. During this time, 500 parents, representing an estimated 600 to 700 children from the greater Philadelphia region are expected to graduate from the program. SafeTogether is a program of Child & Family Connections in partnership with NorthEast Treatment Center and funding from the Barra Foundation. City of Philadelphia’s Department of Behavioral Health & Intellectual disAbility Services, and others.